This article is about the building. For the social fraternity, see FarmHouse. For the album by the American band Phish, see Farmhouse (album). A farmhouse is a building that serves as the primary residence in a rural or agricultural setting. Historically, farmhouses were often combined with space for animals called a housebarn. Other farmhouses may be connected to one or more barns, built to form a courtyard, or with each farm building separate from each other. A Bresse house (French: Ferme bressane) is a type of farmhouse found in the Bresse region that is characterized by its long length, brick walls and wooden roof. A Mas is a traditional farmhouse unique to Provence and Southern France. Historically there were three main types of German farmhouses, many of which survive today. The Low German house or Niedersachsenhaus (Lower Saxony house) is found mainly on the North German Plain, but also in large parts of the Netherlands. It is a large structure with a sweeping roof supported by two to four rows of internal posts. The large barn door at the gable end opens into a spacious hall, or Deele, with cattle stalls and barns on either side and living accommodation at the end. The Middle German house may also be a single unit, but access is from the side, and the roof is supported by the outside walls. Later this type of mitteldeutsches Haus was expanded to two or more buildings around a rectangular farmyard, often with a second story. The South German house is found in southern Germany and has two main variants, the Swabian or Black Forest house and the Bavarian farmstead. A Cascina a corte is a courtyard building whose arrangement is based on the Roman villa found in the Po Valley of northern Italy. A house called Casa colonica [it] in Italy is a type of farmhouse where the residents work the land but do not own the farm. Ta' Tabibu farmhouse and Ta' Xindi Farmhouse are two typical Maltese farmhouses built with the use of Limestone material. In Maltese a farmhouse is called Razzett. 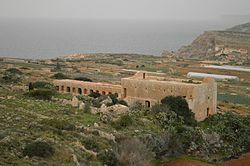 Other examples of Maltese farmhouses are the Ta' Cisju Farmhouse and The Devil's Farmhouse. Ta' Tabibu farmhouse at St. Paul's Bay, Malta. Ta' Xindi Farmhouse at San Gwann, Malta. Norwegian farmhouses used timber or logs and built using Scandinavian vernacular architecture. The first examples are traced back to the 13th century. In some cases farmhouses are built on steep hillsides of the fjords such as the Me-Åkernes farm. An Alqueria is a farm complex named from the historical, Muslim region of Al-Andalus. The Baserri is found in the Basque Country in Northern Spain and Southwestern France. The Cabaña pasiega is a two-level dwelling for farmers and livestock found in Cantabria. The Masia originates from Catalonia, and the Palloza is a primitive, circular dwelling with a conical roof. A Hacienda also occasionally functioned as a farmhouse. Canadian farmhouses were influenced by European settlers. In Quebec, the style varied from Gothic to Swiss, with the kitchen being the most important room in the house. In Ontario, the farmhouses of the late 19th century were of Victorian influence. Earlier ones used clapboard and later variations had brick. Many had front porches. In the west, dwellings varied from single story wooden homesteads to straw huts. Wooden houses were built later as railroads brought wood from the Rockies (Alberta, British Columbia). By the early 1900s houses could be purchased as kits from several Canadian and American companies. Canadian homes often differ from their American counterparts in that the porch was often enclosed. From 1850 onward many featured vernacular interpretations of the more formal architectural styles, such as Greek Revival, Italianate, Carpenter Gothic, and Queen Anne. 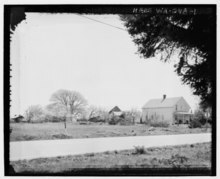 American farmhouses had a straightforward construction designed to function amidst a working farm in a rural setting. They had a simple rectangular floor plan, usually built with local materials, and included a dominant centrally-located fireplace for cooking and heating. ^ Airs, Malcolm (2004). "26: Architecture, Politics and Society". In Jones, Norman; Tittler, Robert. A Companion to Tudor Britain. Oxford, UK: Blackwell Publishing Ltd. pp. 483–486. ISBN 978-0-631-23618-4. Retrieved 4 August 2015. (Registration required (help)). ^ a b Ashby, Wallace (1934). Farmhouse plans. Washington, D.C: U.S. Dept. of Agriculture. Retrieved 4 August 2015. ^ Monmarché, Georges (1949). France, Les Guides Bleu, English series, Nagel, p. 170. ^ "Mas". Centre National de Ressources Textuelles et Lexicales. Retrieved 3 August 2015. ^ Massot, Jean-Luc (1 January 1995). Maisons rurales et vie paysanne en Provence. L'habitat en ordre dispersé. Paris: Serg/Berger-Levrault. pp. 152–157. ISBN 2701303354. ^ Dickinson, Robert E. (1964). Germany: A regional and economic geography (2nd ed.). London: Methuen. pp. 152–154. ^ Lazzaro, Claudia (December 1985). "Rustic Country House to Refined Farmhouse: The Evolution and Migration of an Architectural Form". Journal of the Society of Architectural Historians. University of California Press on behalf of the Society of Architectural Historians. 44 (4): 347. JSTOR 990113. ^ "Ta Tabibu Farmhouse". 8472cdn.biz (in German). Retrieved 28 August 2015. ^ "National Inventory of the Cultural Property of the Maltese Islands", Ta' Xindi Farmhouse, Scheduled 1994, Published 28 December 2012; accessed 2 January 2016, p. 1-2. ^ Nobbs, Percy. Shortt, Adam; Doughty, Arthur G., eds. French Canadian Architecture in Canada and Its Provinces Vol. XII. Toronto: Glasgow, Brook & Company. pp. 667–671. Retrieved 3 August 2015. ^ "What is a Sears Modern Home?". Sears. 21 March 2012. Retrieved 4 August 2015. ^ "Kit Home Information". The Arts & Crafts Society. Retrieved 4 August 2015.